I just got an interesting email from Amazon. My contact told me that I had missed a couple small but important details when I posted about the iPad app update this morning. I'm so very glad that she did because it makes the new app that much shinier. It turns out that along with the new format support, new library layout, and new Kindle Cloud support, the iPad and iPhone apps also got the two key features that was still separating them from the actual Kindles. This might look like a small thing, but Amazon has effectively turned my iPad into a Kindle. They've removed the line between app and hardware, and that is going to make the app worth much more. Now, a lot of people were reporting the update this morning as turning the iPad into a Kindle Fire. That's not quite true. You see, the iPad app is better than the Kindle Fire because the app will now back up the annotations on my personal docs. The Kindle Fire cannot do that; until today only the Kindles had that feature, not the Kindle Fire. So now the iPad is actually better than the Kindle Fire in at least one way (several, actually). Is this a free conversion? Is there a free.kindle.com address? I don’t have an iPad, but an iPod Touch, and like the ability to send a mobi formatted document to my Touch. Give me Android capability to do that and I’ll be in heaven (still grayed out for the moment – hopefully those Apps will be updated before the 25th… will be a nice Christmas present!). If you are sending it to an iTouch then yes conversion is free. You only have Wifi so there cannot be a delivery charge. I didn’t get an email address until I de-registered and re-registered my iPad Kindle device. After that though, it worked great. Thanks! Kindle for the iPad *cannot* count as a real kindle until we can take notes on it. For academics, this is a deal-breaker. Despite owning an iPad, I’m still buying (often used) paper copies, much to my frustration, because they have margins that interface well with portable graphite technology. 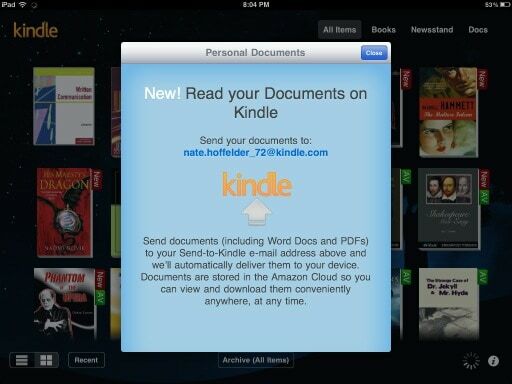 Does Amazon suppose that iPad owners will be driven to switch to kindle hardware by this withholding of a basic feature? But you can add notes and highlights. It’s just that sometimes the app doesn’t want you to. Get it right dude, it’s an iPod Touch.